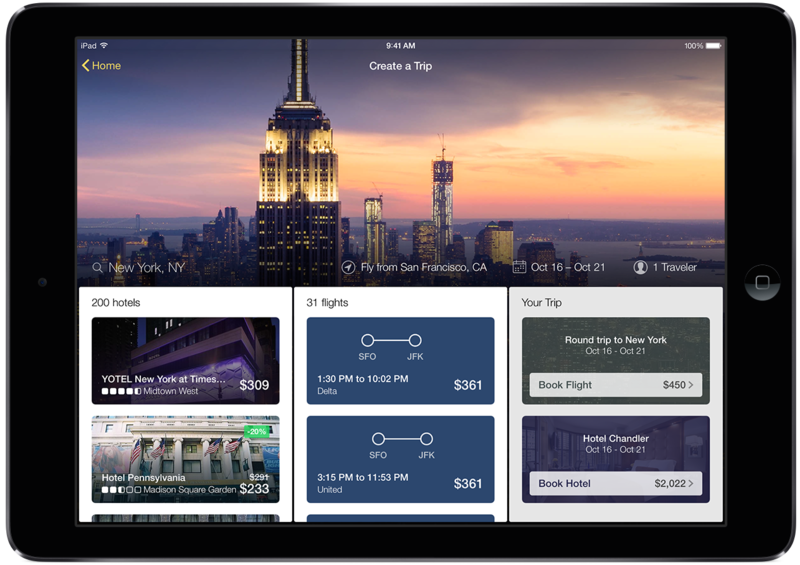 Travel booking website Expedia has revamped its iPad application with a new, tablet-optimized look and improved search. Expedia says that its app is faster at helping you book travel than apps from the competition because of its combined search feature. Single Search Box: To eliminate hefty search interfaces, the new tablet app offers a single search box to do the lifting. When a traveler enters a city] name, landmark, or airport code, the app will surface hotels and flights relevant to that query – no dates or specific details are required at the start. First-Ever Combined Hotel & Flight Travel Search:For the first time in the industry, combined search has arrived for the travel market. Rather than searching for trips in a rigid, linear progression of flights then hotels, or hotels then flights, Expedia is introducing one combined search that provides both hotel and flight results simultaneously, available all in one glance. Collections:Expedia presents various themed travel destinations to spark interest in future journeys. Collections offer customers the opportunity to explore vacation destinations they may not have otherwise considered. Beautiful locations come to life in a particularly compelling way on tablet devices. Collections offer a rich combination of design, mobility and travel research. Content is catered to various regions and will be updated based on traveler feedback. Integrated Trip Planning, Booking, & Data, Shared Across Devices:Earlier this year, Expedia introduced Scratchpad in certain markets around the globe. Scratchpad is an easy way to keep track of your travel searches. When a traveler is signed into an Expedia app, trips researched on a tablet device will appear on the desktop or mobile Scratchpad. This allows travelers to begin their travel planning from where they left off – on any device. A new version for Android tablets is also available. Expedia also has an iPhone version , and both apps are a free universal download on the App Store.